BAKERSFIELD, CALIFORNIA (December 22, 2017) – The inaugural Bakersfield Indoor Kart Nationals has been announced for January 19th-20th with two complete days of Outlaw Kart, Clone kart, and Mini Dwarf racing, culminating in a $1000 to win Open Outlaw feature. All told six different divisions will compete at the Bakersfield Karting Experience 1/10th mile dirt oval with complete features each night. Open Outlaw Karts, Junior and Senior Mini Dwarfs, and Beginner Box Stock make up the Friday card while Open Outlaw Karts, Clones, and Box Stock are scheduled for Saturday night. The newly opened Bakersfield Karting Experience is a state of the art entertainment venue and the first indoor dirt karting oval with karts rented to the public. The facility also boasts RC car racing, golf simulator, arcade games, and Smokey’s Grill & Pub. BKE is open to the public 7 days a week with karts available for rent for a single race or for group outings. Racing action began at BKE in the fall with each of the indoor nationals divisions getting their taste of the facility. Additional Open Outlaw Kart races are also scheduled on December 29th, February 16th, and March 2nd as part of a five event series. 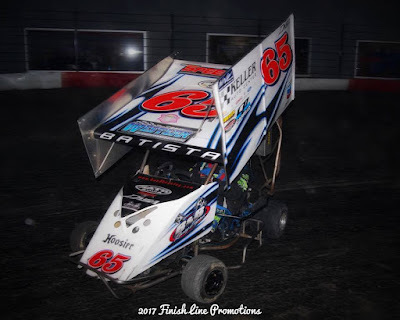 Open Outlaw Karts have been a staple of dirt racing and driver development in California for nearly three decades with many top drivers getting their start in the division. The winged machines now have a home facility in the racing-centric community of Bakersfield. Bakersfield, CA – The 2018 SPEARS Southwest Tour Series was announced last week, which included the $10,000 to win May 5th race at The Bullring at LVMS, thanks to longtime series sponsor Retro Custom Metals. Today, the series is proud to announce that David “Homie” Mulcahy, owner of Retro Custom Metals, has stepped up even more for 2018, by paying $10,000 to win the 2018 Season Finale on November 17th at the Bullring, as well. Retro Custom Metals is a leader in the architectural sheet metal industry, specializing in custom copper, zinc, and steel roofing and interior & exterior accents for residents or business. Another update to the 2018 schedule is the potential July 14th race date. Currently there are three tentative race dates, in which one or two will be filled to solidify the 2018 SPEARS Southwest Tour Series schedule. The SPEARS Southwest Tour Series opens its season on March 24th at the Madera Speedway. Celebrating its eighteenth season in 2018, the SPEARS Southwest Tour Series is a regional stock car series competing on paved ovals in the southwestern portion of the U.S. http://www.srlsouthwesttour.com. “The SPEARS Southwest Tour Series…Where the Champions Race”.